I purchased this stone from LAD mid 2018 and have decided to part with it. I had it graded after purchasing and it came back as 1ct/N Very Light Brown/I1 due to a white feather that is very hard to spot! It ranges in color from a very very light peachy color to a warm white, I'll let the pictures do the talking. The measurements are 6.26 x 6.42 x 3.89. The report number (with plot) is 5191626735. It's a beautiful stone but I now have my engagement ring I want to pass it on to someone who will get more wear out of it. 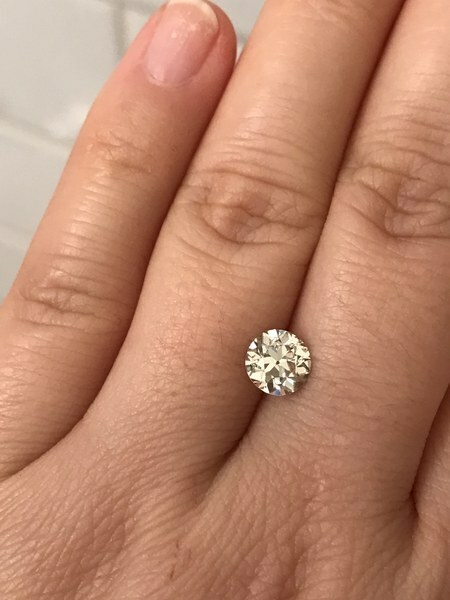 The price was $2,100 which is what I paid + the cost of GIA grading but I'm motivated to sell and will take $1400 as I will be moving soon and could use the extra spending money. I will ship the stone insured within the US at my expense.